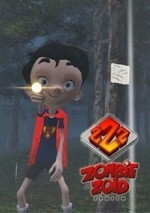 ZombieZoid Zenith is an action game in third person where you will embark on a journey to the side of the little Arthur to find and protect his girlfriend. While the lovebirds were talking on the phone, the news reported that a terrible virus was infecting the town’s people and turning them into zombies hungry for fresh meat. Now, this young man will venture the streets dominated by the dead to reach the house of his beloved before the worst happens. Like Arthur, try to be brave enough to face any danger that arises ahead.